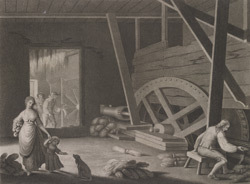 View of an 18th century Irish Scrunch Mill. In the 18th century, Ireland became one of the largest producers of linen in Europe. This is the fifth plate in a series of twelve views of the manufacturing process produced by W. Hincks. The scrunching process separated the flax fibres from the unwanted woody stems, originally this task was completed by hand but the worker in the background is holding the flax in place whilst the blade is turned by water power. The mills would have been filled with flax dust known as ‘pouce’ which created a very unhealthy environment for the workers. The male worker to the right of this print is breaking the flax between two rollers.